The Nye County School District is located in the south-central portion of the State of Nevada. It is the third largest county in the continental United States and has one of the largest geographical school districts in the nation. Their school buses must not only undergo all of the normal hardships that buses are put through, but they must also stand up to the special challenges of the high desert environment. Searing daytime heat and bone-chilling nightime cold are the norm. Add to that the abrasive effects of blowing sand and the destructive power of ultraviolet light, and you have a combination of forces that few coatings can resist for very long. 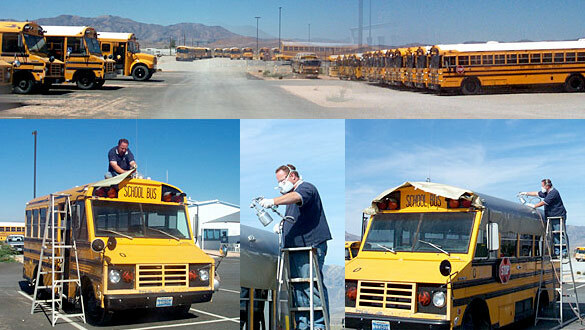 With these challenges in mind, the Nye County School District Maintenance Department selected Rust Bullet for special testing on their buses.